While I was in the UK for the MWA Awards Ceremony I managed to book a performance tour alhamdulillah. Thanks to the help of many friends and acquaintance, in two weeks I visited London, Leicester, Liverpoole, Blackburne, Briersfield, Huddersfield, Hounslow, Banbury, Oxford, and Milton Keynes. Mashallah! I loved being among the Muslims in these communities, which I found vibrant and welcoming. Overall I told the story of Musa aleyhisalam to around 1000 children and adults in thirteen performances, in schools, mosque associations, and madrassas. Children aged 4 and up were enthusiastic and generous listeners alhamdulillah, and I sold lots and lots of books and CD’s too. When Wings Expand Wins UK Muslim Writers Association Award!!! Alhamdulillah the Muslim Writers’ Association short-listed WINGS for an award in its 2011 Unpublished Children’s Work category, and then it was announced as the winner in that category at an awards ceremony at the Shakespeare’s Globe Theater in London on 22 November. InshaAllah it will be released by Kube Publishing this year, make dua!! It is in its final stages of editing….sometimes the most painful stages so I’m not kidding when I say make dua! The Stories-of-Light Website http://maryamsinclair.com/ is finally in its last stages of completion! Alhamdulillah even with no promotion or announcement, the moment the ordering process was put into place, orders for CD’s started coming in. And thanks to CD Baby, the CD as digital downloads are now available through them, though iTunes, and in a short while, inshaAllah, from the Stories-of-Light site too. 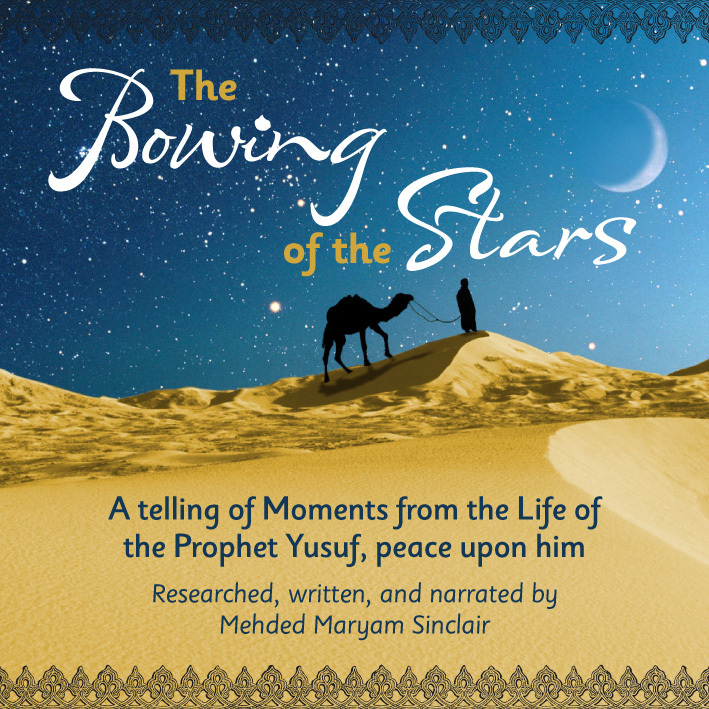 For now, following this link http://cdbaby.com/cd/mehdedmaryamsinclair2 will take you to the Bowing of the Stars order page, where you can hear a sample from each track and order a download! And clicking on http://cdbaby.com/cd/mehdedmaryamsinclair will take you the the page featuring A Mercy to the Worlds. My new book, When Wings Expand, is in its final stages of revision now and will be published early next year by Kube Publishing UK. I am fortunate to be working with a brilliant and very patient editor, Yosef Smythe, and fortunate too that my mentors Pattie Gauch and Kim Griswald, with whom I worked in two amazing Highlights Foundation Founders Workshops, have read generous parts of the manuscript and have made their considerable experience and expertise available to me, alhamdulillah. I walked through the house this morning before everyone got up and the silence really scared me. Mehmed woke up next, calling out for Mama. When I went into his room he just turned away from me and stuck his head under the covers. I felt so hurt, especially after last night. I ran back to my room and threw myself onto my settee. My throat was aching and I just started to cry and cry like I would never be able to stop. I didn’t know how to be different, to be strong. It was all just a bunch of words, Buraq. I was remembering the butterfly on the sunflower, and the feeling that Mama was soaring away somewhere, and that I had wings beginning to grow, but none of that was real! It was just all my imagination! Why couldn’t she just have beautiful wings in this life here with me? Why did she need to die?? When I saw the butterfly fly away, I saw my mother and her beauty and her grace flying away from me. I wanted her here with me! I cried harder and harder and harder but I began to see that no amount of crying would change anything, and finally I felt Baba sit on the floor beside the settee. “I’m here, Nur. I love you.” Buraq, it was amazing. He didn’t have to say anything…I just felt the pressure leave me slowly, and I actually started to feel almost like peace come into my heart. Mehmed came in and crawled onto my bed, and we all just stayed there together, me and Mehmed on my bed, Baba on the floor, for a long time. It really helps to be in the woods, you know, Buraq? How does Baba know that bringing us to the waterfall is the best possible medicine? Even Mehmed was smiling sometimes by the time we got into the car to come back. In the afternoon Baba took us back to the cemetery. We lay down together on the grass near Mama’s grave and Baba asked Allah to reach into our hearts and heal the wound that her dying is for us. 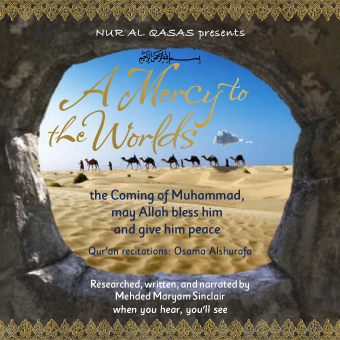 GIVE THE GIFT OF NUR AL QASAS FOR EID! You can place orders easily by sending a message with your exact order and your complete postal address to maryistanbul@gmail.com. We’ll send you your invoice and you can pay by paypal to the same address. May these last ten days of Ramadan bring you deep intimacy with Allah and His grace in every aspect of your lives. A Mercy to the Worlds Goes Everywhere! 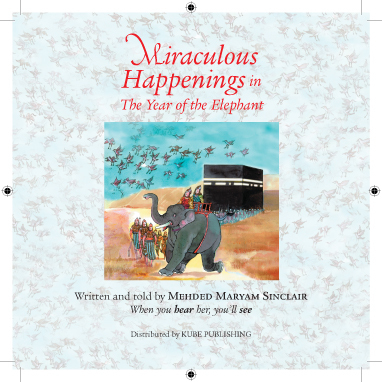 Through light-hearted and gentle storytelling that inspires love and longing for Allah and His Messenger, Ms. Sinclair introduces children to Muhammad, may Allah bless him and give him peace. She verifies for them, in a way appropriate to their needs, that Islam is the culmination of the Message of Allah, a message that opened with Adam, peace upon him, and was sealed with Muhammad, may Allah bless him and give him peace, renewed through time and purified from human alteration by the prophets in between, peace upon them one and all. WHY MIRACULOUS HAPPENINGS IN THE YEAR OF THE ELEPHANT? WHY NUR AL QASAS? I saw something last night that made me realize again why I am trying to set up Nur al Qasas as a resource…may Allah guide me and show me how to work for His sake alone, in ways that are pleasing to Him. WELCOME BLESSED DAYS OF HAJJ!!! The circle turns and the glorious days of Hajj return again, alhamdulillah, full of blessings for those fortunate enough to go on Hajj, and full of blessings for the rest of us staying at home too….these days magnify our good works, demonstrating yet again the magnanimity of Allah Mighty and Majestic. A mother on a homeschooling list I belong to asked if anyone had a skit dealing with the story of Hajar, may Allah be pleased with her, and Zam Zam. That put me in mind of the very happy memories I have from being in the classroom these past years and doing activities with children to develop a love and yearning in them for the truths of their tradition. A skit has its difficulties sometimes…it seems that children are not to be allowed to play the parts of the Prophets, or the Companions, which is always a little hard, because playing roles is how young children learn best. I pray that someday I might have the opportunity to talk in depth with a fiqh master about these subjects. Perhaps, since there is a big difference between a classroom or household of small children trying to grow and learn and a “theater company” of adults portraying roles for show rather than for play, there could be a different ruling…only a gingerly asking, since I am not a scholar of fiqh. NOW YOU CAN GET MEHDED MARYAM SINCLAIR’S SPOKEN WORD WORKS AS DIGITAL DOWNLOADS! When you hear, you’ll see, inshaAllah! Click on “For Kids” (though we know it’s not just for kids!) for a full listing of what’s available now: the three CD’s–the brand-new not-yet-even-pressed-yet Mercy to the Worlds, Miraculous Happenings in the Year of the Elephant, and The Bowing of the Stars, along with three shorts—From Torture to Triumph, Two Prophets in the Endless Sea of Allah’s Knowledge, and Walnut Remedy. Visit today! Hear the samples! Order the downloads! A Trust of Treasures is available from Amazon in Japan! The Grand Mufti of Jordan Sheikh Nuh Ali Salman has heard parts of A Mercy to the Worlds-the Coming of Muhammad, May Allah bless him and give him peace, that were translated into Arabic for him. He said, “This is beautiful. It will surely inspire love for Allah and His Messenger. The Arabs need it too…please make an Arabic version.” A preliminary translation was then made of the whole piece, and another mufti in his office both listened to the English recording and read the Arabic script and declared that it was sound, alhamdulillah. ©Mehded Maryam Sinclair and Nur al Qasas, 2008-2010. Unauthorized use and/or duplication of this material without express and written permission from Mehded Maryam Sinclair is strictly prohibited. Excerpts and links may be used, provided that full and clear credit is given to Mehded Maryam Sinclair and Nur al Qasas with appropriate and specific direction to the original content.